Once a year, COTERC holds a big party to celebrate the rainforests and the people who are working to help keep them healthy. It is known as Fiesta Verde and is held annually in Toronto, Canada. But what if you don’t live near Toronto and you wished to take part in the celebration? You will be happy to know that COTERC has thought about this and came up with a neat idea that will allow the whole planet to celebrate along with them in Toronto. COTERC recognizes that many of its friends and supporters can be found all over the world and they are just as enthusiastic as the supporters in Toronto so here is how you can celebrate right there in your own community. COTERC wants you to host your very own Fiesta Verde! Maybe you don’t want to plan a dinner for 150 but what about planning a get together on a smaller scale? Here are some ideas of how you can host your very own mini party or Pequeña Fiesta! 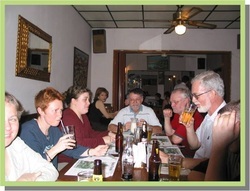 · Invite some friends together and have a Caribbean themed dinner. Station so that they can see how awesome it is. If you are willing to do all of this for COTERC, then we will be so happy to help you out. Here are some of the resources that COTERC will make available to anyone planning their very own Pequeña Fiesta. can match your party to ours. · A video message from the COTERC Board of Directors thanking you and your guests for your support. · An exclusive opportunity to have access to the videos being shown at Fiesta Verde. would love to have a photo of your celebration to post too! Would you like your party to directly support COTERC in meeting its objectives? Why not turn your party into a fundraiser too! We leave it up to you how you would like to collect donations but every little bit helps out. Please remember to obey all laws and regulations in regards to lotteries, raffles, or draws. *Please include a request for a donation tax receipt if you are able to use one. Funds are not the only ways to support us. If the members of your party would like to find out more about COTERC and the activities that it is up to in Canada, Costa Rica or anywhere else in the world, please collect an e-mail list for us. We can add your friends to our mail list and they will receive news and updates from us throughout the year. If you have created a list, please feel free to e-mail it to us at info@coterc.org. COTERC wishes to thank you immensely for all of your effort to support us in meeting our goals. If you would like to learn of other ways that you can support us, have a look at the COTERC Supporter Manual.